Strike the Pose There's Nothing to itâ€¦..Vogue! Oh my it is lights, camera action at Bingo Cams! I have been very curious to see this site for the unique webcam feature they have. But unfortunately the US is banned from even viewing the site. So what is the first thing I do when I came to the UK? That's right I headed straight to Bingo Cams! 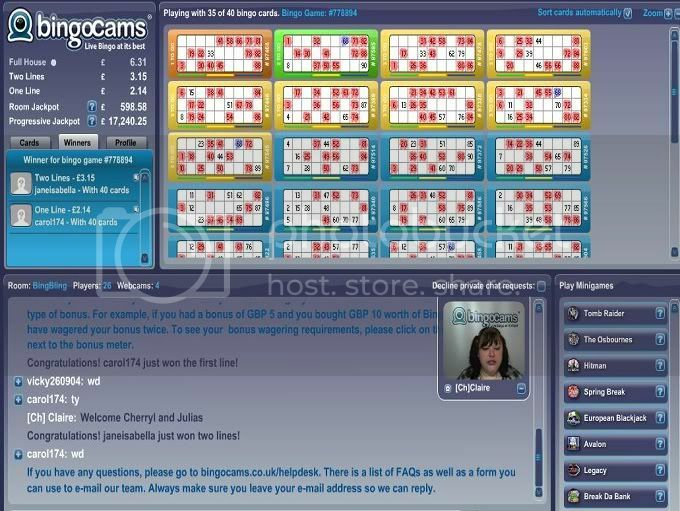 I was completely caught up in the chat host who is on live cam in the bingo room. One thousand thoughts are going through my mind as I am wondering how she keeps the dialogue up, how she has to primp before hand and everything else in between. It was quite refreshing to put face to the chat host and to be honest I would really like to see more bingo sites offer this creative feature. I didn't put up my web cam because I had my hair slung in a ponytail and still had pillow wrinkles on my cheeks! I was in the 90 ball bingo room and played 35 cards with the free signup bonus money I received after joining. The Progressive Jackpot was worth a whooping 17,204.05 pounds and I had visions of great things I would do with that kind of cash if I won. The closest I came to a bingo was one to go on a single bingo card and had barely even realized it I got so caught up on the chat host. This site is really great fun and even though I lost the entertainment value was worth every single pound!